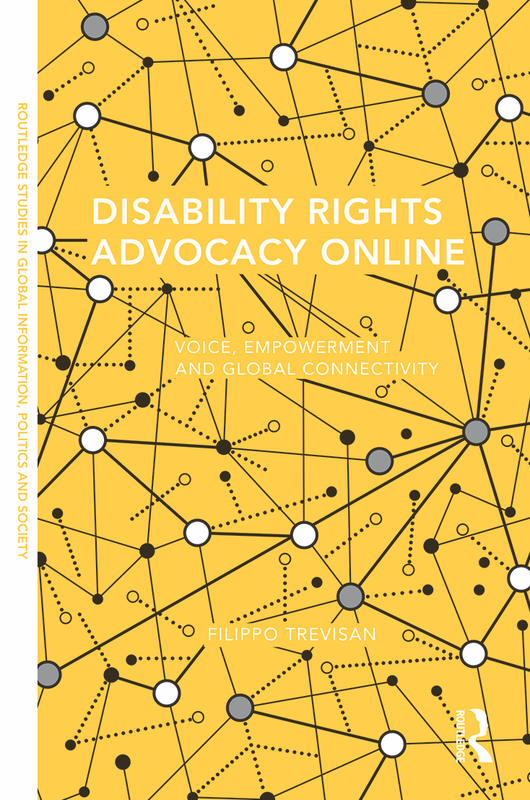 My book Disability Rights Advocacy Online: Voice, Empowerment and Global Connectivity is now available in paperback edition. Click here to order your copy and use discount code FLR40 at check out for 20% off. If you are interested in using the book for one of your classes, you can also order an inspection e-copy – I’d love to hear from you if you plan to include this work in your courses! The book examines the rapid and unexpected digitalization of disability rights advocacy in the UK and the U.S., discussing the tension between the ability of digital advocacy to enhance the stakes in democratic citizenship for Internet users with disabilities and persisting Web accessibility issues. Given the urgency of crises faced by people with disabilities and other marginalized groups around the world, this book draws valuable lessons for anyone interested in progressive digital advocacy and inclusive social change. To read the full synopsis, click here. I look forward to taking part in a special panel on disability, technology and human rights at the 2019 International Studies Association’s Convention in Toronto, Canada on Saturday March 30, 1:45pm. The panel, which is titled “Accessible Global Governance: Technological and Policy Innovation in Support of Disability, Development, and Human Rights for All,” brings together a group of research leaders in disability and human rights to discuss emerging opportunities for disability advocacy on the global scale. This panel is sponsored by American University’s Institute on Disability and Public Policy (IDPP). In my presentation, I will discuss some of the highlights from the first global survey of Disabled People Organizations’ (DPO) leaders about accessibility and the potential role of technology at international conferences, meetings, and events. I’m currently in Australia on a fieldwork trip for a new project and will present some preliminary insights at the University of Melbourne on Wednesday February 13 together with my colleague and collaborator Ariadne Vromen of the University of Sydney. This new work explores recent changes in how advocacy organizations approach storytelling and reviews the role of digital technology in the ‘datafication’ of storytelling techniques. The seminar will take place between 1:00-2:00pm in the Arts West North Wing building, room 253. We’re grateful to the Media and Communication Program and particularly Scott Wright for giving us this opportunity to discuss some of this new work. This week I’m honored to co-chair the Culture, Diversity and Inclusion mini-track at the 52nd Hawaii International Conference on System Sciences (HICSS) together with my AU colleagues Derrick Cogburn and Nanette Levinson. The mini-track includes two exciting sessions at 8:00am and 10:00am on Friday January 11th with a total of five papers focusing on issues of disability, race, and age in digital and social media. As part of this mini-track, I’m also going to present a paper I co-authored with Derrick Cogburn on “Technology and Grassroots Inclusion in Global Governance: A Survey Study of Disability Rights Advocates and Effective Participation.” The paper discusses the first global survey of disability rights advocates about their use of technology to participate in global governance processes including both U.N. and non-U.N. international meetings, conferences, and events, as well as the use of social media to engage with disability grassroots in their respective countries. To access a free copy of the paper, click here. To read the full review, click here (free access). To learn more and purchase the book, click here (use code “FLR40” at checkout for 20% off). On International Day of Persons with Disabilities 2018, the Institute on Disability and Public Policy (IDPP) launched a new white paper report on “Accessibility in Global Governance: The (In)Visibility of Persons with Disabilities.” Co-authored by the IDPP Executive Director Derrick Cogburn and myself, this white paper is the culmination of a two-year research project that included subject matter expert interviews and a global survey of disability rights advocates from over 50 countries, most of whom in developing parts of the world. This research, which was supported by The Nippon Foundation, is the first study to comprehensively map barriers to accessibility at United Nations meetings, conferences, and events, as well as other important international forums. In addition, the report also offers examples and recommendations based on recent international conferences that pioneered the use of accessible Information and Communication Technologies (ICTs, including both web-conferencing software and telepresence robots) to facilitate effective remote participation for people with disabilities. To read and download the full report, click here. New Book Chapter: “Mapping the Search Agenda” – Election case studies from Italy, the UK and the U.S.
How can we use Google Trends to map information flows in election campaigns? Andrew Hoskins (University of Glasgow), Sarah Oates (University of Maryland, College Park), Dounia Mahlouly (King’s College, London), and I addressed this question in a recently published book chapter titled: “Mapping the Search Agenda: A Citizen-Centric Approach to Electoral Information Flows.” The chapter is included in the volume (Mis)understanding Political Participation: Digital Practices, New Forms of Participation, and the Renewal of Democracy, which is edited by Jeffrey Wimmer, Cornelia Wallner, Reiner Winter, and Karoline Oelsner, and published by Routledge. This chapter builds on a previous article and applies a new methodology that uses Google Trends data to map key information demand trends in elections in the U.S., UK, and Italy, comparing Internet search trends to the salience of key figures and issues in the news media in each country. Findings for the Italian case (which explores the 2013 general election) are particularly relevant in light of the upcoming Italian election on March 4, 2018. Italian voters demonstrated a particular inclination to looking for information about anti-establishment leaders online by going directly to websites and social media accounts run by parties and other movements, instead of the websites of established news organizations. In light of this, the chapter reflects on how low levels of trust in traditional news outlets boost the relevance of the Internet as a source of alternative news and augment opportunities for political groups, particularly anti-establishment ones, to control the agenda and steer public debate.